I saw this graphic and was inspired. 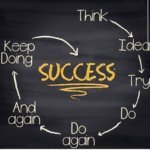 Think => Idea => Try => Do => Do Again => And Again => Keep Doing => Success. This is exactly what I try and do every single day. Persistence is key to success.